DE filters are wonderful. They have the capability to filter about 3 microns. You do not need to buy any cartridges for them. If your pool is always kept clean, they require little maintenance and back flushing. Well-maintained pools will just require reloading of DE or the fiber clear once every month. Cleaning can also be done once in a year if your pool is kept immaculate. The entire filter assembly and the grids must be kept clean at all times. When you need a professional pool cleaning service to clean your pool, be sure to call the cleaners Fort Myers turns to, call GrandSlam Pools. The following are the procedures, tips, and ways of cleaning a pool. These steps help save a lot of money and inconveniences that may be brought by hired cleaners. Approximately 90 percent of filter cleaning can be manually done because it is a simple task. The remaining 10 percent of the cleaning requires manual dexterity and patience. Pool filter cleaning should not be handled by untrained people. If it is not done in an appropriate way, it can result in negative consequences. If you forget to depressurize the filter, some parts may fly out at a lethal speed. If pool filter cleaning is not done in the right way, expensive parts may be damaged. If cleaning is done in the right way, you can save hundreds of dollars each year. You are advised not to do filter cleaning until you have keenly watched a professional conduct the task on your filter. Take notes and also remember that filters are different, so some expertise understanding is needed. It is important to understand the appropriate time to clean your pool. When the pressure gauge reads 8-10 psi above the required level, you may clean the filter. DE filter should be cleaned once in a month. The main steps of cleaning the filter are backwashing it, cleaning the grids and manifolds, and finally adding a new DE. 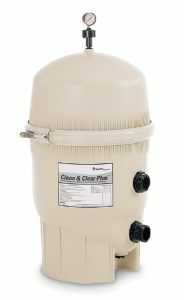 Backwashing is the first step of cleaning a DE filter. It helps remove all dirt and debris from the filter. Place the DE filter valve in a backwash position and start the pool pump. As soon as the clear water comes out of the discharge hose, switch off the pump and reset the valve to its initial position. After backwashing is over, ensure the pump is off. Ensure the air relief valve is opened and remove the drain plug to allow water to flow out of the filter tank. The next step is undoing the bolts or releasing the clamp that is around the reservoir. All these depend on the model of the DE filter. After opening the tank, ensure that the manifold is removed and get rid of each grid. This can be done by using a garden hose flush. Rinse the rest of the tank using the hose pipe. After cleaning the filter, remove the grids and place them in the manifold. After cleaning and putting back the grids, lubricate the inner ring of the tank. To add DE into the filter, begin by priming the pool pump. Get rid of the strainer basket lid then fill the bucket using water to allow water to flow through the incoming line. Lubricate the gasket or the O-ring in the pump cover using Leslie’s Pool and Spa lube. After doing that, replace the lid and ensure other bolts and clamps on the pump are tightened. Release excess air from the tank; this is done by turning on the air relief valve. After doing that, ensure the pool pump is turned on. When water starts to come out, ensure that the air relief valve is closed. The pump should be running before adding the DE. A simple calculation is enough to find out the amount of DE required for your filter. The size of your DE filter is noted in the filter’s instruction manual. Taking the square footage of the filter and dividing by five gives the number of DE scoops that should be added. The DE and the DE scoop can be gotten from Leslie’s store. Mix DE with enough water, so as to come up with a creamy mixture. With the running pump, pour the creamy mixture into the pool skimmer. Doing that ensures that the DE is drawn to the filter and spreads evenly over most of the grids. The process of cleaning the DE filter is over after adding DE. The last step is allowing the pump to run for about half an hour before it is turned off. GrandSlam Pools are effective in controlling algae and bacteria in a pool of water. It also provides a safe and clean swimming environment. Call us and save yourself the hassel, and stay safe!